The global corundum market is expected to grow at a higher rate during the forecast period, 2018 to 2023. 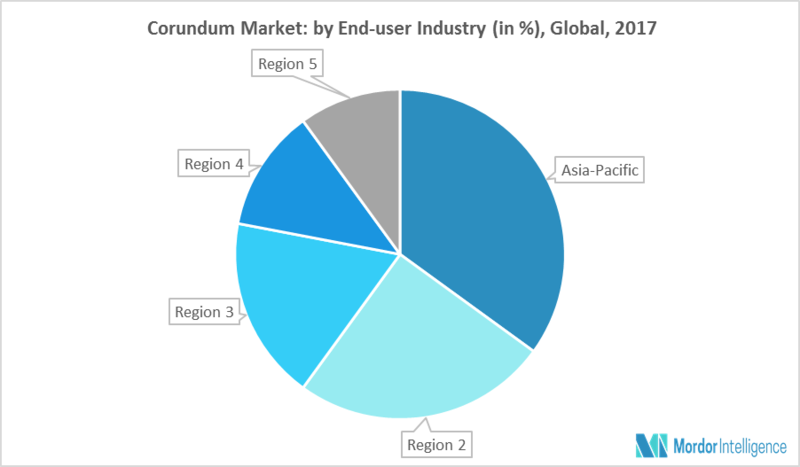 Asia-Pacific is the major producer and consumer of synthetic corundum, with China owning the prime credentials for this region in the electronics sector. Corundum is usually classified into ruby, sapphire (including padparadscha stones), and emery. The major applications of corundum are jewelry and abrasives. To meet its growing demand, corundum is also being manufactured artificially. Natural corundum is used in a wide variety of industrial applications because of their toughness, hardness, and chemical stability. It is mainly used as an abrasive for grinding optical glass and for polishing metals. Additionally, corundum is converted into sandpaper and grinding wheels. Corundum, in its varied forms, has several applications, for example, ruby is widely used in jewelry, and sapphire is used in LEDs and refractory substances. Moreover, corundum is used in the preparation of toothpaste since its abrasive properties help in keeping teeth clean and white. To cater to the growing demand, corundum is now being artificially produced using calcined bauxite. It is also used for making refractory products such as firebrick, kiln liners, kiln furniture, and in electronic applications. Synthetic corundum is used in the production of windows of store scanners, watch crystals, aircraft windows, and protective covers for electronic devices. Usage of corundum is increasing rapidly in the field of electronics, driving the market. India, Thailand, Korea, Japan, Germany, and other parts of Eastern Europe are the major manufacturers of corundum. As for North America, demand for artificial corundum is high, due to the scarcity of natural corundum in its region. In Asia-Pacific, corundum is mined at Sri Lanka, India, Myanmar, Afghanistan, Vietnam, and Thailand. The mines in this area provide some of the best materials for jewelry. Additionally, corundum is India’s main inorganic chemical export to China. February 2018: Pink corundum market set for rapid growth worldwide, focusing on business strategies of the key players, and market fundamental dynamics during the forecast period (2018-2023). December 2017: DENSO and Kyoto University startup FLOSFIA will develop Next-Gen power semiconductor device for electrified vehicles using the application of corundum structured. November 2017: China Alumina to import synthetic corundum and aluminum hydroxide to cater to its growing demand in multiple industries. Major Players: Alteo Alumina, Henan Sicheng Co Ltd, LD International Abrasives Limited, and Rusal, among others.